This appeared in an e-mail from a friend of mine and I found it quite challenging. 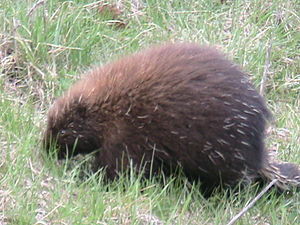 The porcupines, realising the situation, decided to group together to keep warm. This way they covered and protected themselves; but the quills of each one wounded their closest companions. After awhile, they decided to distance themselves one from the other and they began to die, alone and frozen. They came to realise that they had to make a difficult choice: either accept the quills of their Companions or disappear from the Earth. This is a salutary reminder of how we in Church should be; too often we fall out over the little prickles that in reality are inconsequential and unimportant. By doing so we fail to honour our Lord Jesus who spoke of “turning the other cheek” and we send out a poor witness to the world around us. We need to learn tolerance and forgiveness and an attempt at understanding what it is that makes some people more prickly than others. Trouble is that its no good just talking about how prickly others are towards us but maybe we also need to learn what we do that prickles other people !!!! Found this on my facebook page and thought that it summed up the sort of day I am having today. I announced to Alison this morning that I was having a `tiggerish` day (Tigger from Winnie the Pooh ??????) and I`m just in a silly mood. Then this afternoon I opened up Facebook and this appeared……………. It certainly brought a smile to my face, for I was blessed with a wonderful childhood full of the characters mentioned above, allowed to let my imagination roam free and to be creative in my play, but most importantly of all I was blessed with two wonderful parents who allowed me to be childlike both in my childhood days and now in my supposedly adult days. My father still talks about not being entering his second childhood as he’s not finished with the first one yet ! Life is short and given to us by God to be enjoyed and whilst I appreciate that for some life is very difficult and more about survival than anything else those of us for whom life is good should not allow ourselves to be pulled down but hopefully by our exuberance and sensitive enjoyment of life we might be able to pull others up. Mission shaped by eschatology ?? As someone who is involved in the Fresh Expressions movement and has read the Church of England report `Mission shaped Church` I find this quotation interesting. Eschatology refers to the study of the end of things, specifically in Christian Eschatology it refers to the end of life, and what God has promised to do in the next life. Basically Tom Wright is saying that what we believe about Heaven and Hell, about the salvation Jesus has offered us should affect the way we go about mission. So often mission has been a readily defined formula of “hit em with the Gospel, and get away before they know whats happened !” I too was once engaged in what I would call `hit and run` missions and would still place a value upon them today in certain circumstances. However Tom Wright is pointing us towards a more relational approach in as much as when we realise what God has done for us then we desire it for those closest to us also. Hit and run isn`t necessarily about those closest to us, but its a bit more scattered. Relational evangelism is about getting alongside the person, getting to know them, showing an interest in them and allowing that to open up opportunities for meaningful conversation in which your own heart for Jesus can be revealed. However, that takes time. Now part of the Christian eschatological belief is that the end of the world may come at any moment. This does put a certain urgency on all we do or say. 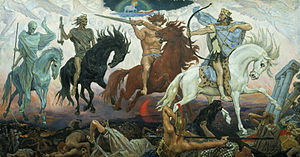 If we think the world could end tomorrow then it affects the way in which we talk and share with our nearest and dearest today; there’s nothing quite like the thoughts of the four horsemen of the apocalypse (below) for focusing the mind on salvation and specifically salvation of others. So how do we marry the two aspects together ? the need to take time in evangelism and the urgency which the Bible seems to speak of ? 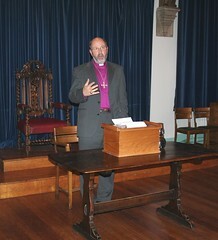 I feel that it is about being honest with ourselves, our own beliefs and then being honest with others; it is about `living our lives` as Christians in a specifically Christian manner and letting that affect others; it is about speaking the Gospel whenever there is an opportunity but also knowing when to keep quiet. Above all else it is about loving others in the way we know Jesus has first loved us and living accordingly. These are my ramblings at 1.15 a.m. Hope they`re not too incoherent. As part of my preparation for a days teaching I`m involved with in a couple of weeks time I have been looking at some videos on You Tube (it’s a good excuse). The subject is Fresh Expressions of Church and I came across the following link, http://www.youtube.com/watch?v=D7_dZTrjw9I&feature=related . Under the title “What if Starbuck’s marketed like the Church ?” it satirises how many Churches make themselves known. The trouble is that as I watch the video I see a tremendous amount of it relating to various Churches I have served in, and also in places to my own style of Ministry. Have a look at it and mark down how many times it resembles your Church. Its challenging and frightening, and we sometimes wonder why people don`t come back again. 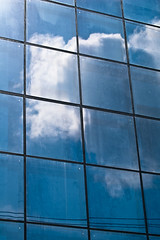 Perhaps we need to look at some of the world around us and see how they market their product. Starbucks itself is always warm and welcoming, smiling assistants and what comes across as a genuine desire to please. Yes, I know they are trained that way but doesn`t it make for a more fulfilling visit ? Macdonald’s, clean, modern and a constantly updated menu. Lucozade changed their product appearance without altering their product and now have one of the largest selling soft drinks in the world. So often in Church we try to peddle the unchangeable product (faith in Jesus) through the same style as we have grown up with, old crumbling buildings, hard wooden pews, organ music and nothing else, older hymns and silence instead of new songs and a jubilant atmosphere. So how does the Church change its image ? The great starting point for the whole Fresh Expressions movement is that of 360 degree listening: in other words we need to listen in all directions, God, society, the Church, other Christians. We need to assess the culture around us and see how we can respond to that culture. In places where this has happened a variety of worship experiences and new Churches have begun, messy church, theatre church, cafe church (interestingly Starbucks and Costa Coffee now invite Churches to meet on their premises), skateboard church, bread-making church and the list is endless. Why ? Because Gods creativity is endless. We are called to listen for him, to observe what is going on around us and respond accordingly. It is my prayer that the church stops messing around on the edges and gets real with life, engaging with the needs of people on the street and not simply those `in the church`. Lets stop being what the world doesn’t want and lets start delivering what the world needs. 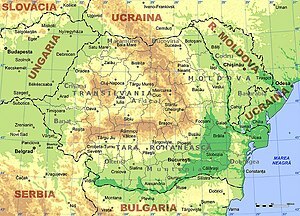 What to do about Romania ? Its happened again ! Each year I aim to give an up to date report of the Romania trip and each year something happens to stop it. This year we seem to have come up against many of the issues that Alex and Heather face regularly. Slowness of the internet speed on my mini-laptop meant it was painful to write even the shortest blog, and then on one day we lost all electricity so there was no phone, wi-fi and no power. On that same day the water went off for eight hours. It gave us a taste of the isolation the Chalmers family feel. Poinana is literally on a road to nowhere and is some way away from Ovidieu and further from Constanta. These are the two local towns/cities where goods can be bought. Consequently when the power is down the Chalmers family are cut off. The photograph below is of their house and Church. You can see how dusty the ground is as there hasn`t been any decent rain for weeks now. We have helped lead the children’s club this week on the theme of the `ups and downs` of Simon Peter. Ranging from between 15 and 30 children there has been a lot of laughter, fun and enjoyment. It has been great to see the children I`ve now known for several years grow and develop. However these children face many problems in their lives, owing in part to their circumstances. You can`t help but despair at the cycle of poverty that they are in. Some families are several children, Mum and Dad in one room, clothes handed down, and alcoholism rife. Despite all this the children smile and play like any other children anywhere else in the world. Their parents greet us like long-lost friends and it always feel special to go back there. This is my fifth visit and I was delighted that some of the children not only remembered my name, but even some of the British Sign Language I taught them two years ago. Wonderful ! On top of that we also bagged a lot of clothes, shoes, toys etc to give out to the villagers; I cut the grass yet again and without breaking the lawnmower this year ! On Saturday one of the villagers came to call. Annjella is a strong, independent sort of person. She has five children, her partner and her partners father living in a small run down house. On Saturday she was in tears as her landlord had called that morning and said she had to vacate the house by Tuesday (Tomorrow)–three days notice. This is how precarious life is in Romania. Fortunately she has a house to move to that they were building, but it is far from finished with no ceiling, heating, electricity or water. As a team and with the Church we have provided the finances for the ceiling but what an awful situation to be in; and yet this is day-to-day life. In this country we complain about a drop of rain, but Romania would love to see a good downfall before crops are completely ruined; we complain about the cold and yet people in Poiana are entering their winter phase when temperatures will drop to -25 degrees and the snow will come; we complain about our household bills and yet people in this precious village are being evicted at short notice into unfinished buildings. The world is full of injustice and so often it is a lottery where we are born, but I still come across people who are uncaring and selfish. Several years ago I was collecting for those whose homes had been lost in Bangladesh through flooding and someone actually said “Its their own fault for being born there !” What a crass horrible thing to say and think, but so often we in the wealthy west think we are poor when we cannot afford to buy a second car or when we have to scale back our holiday from a ten-day cruise to a weeks cruise. Well, I want to say that real poverty is wondering where your next meal is coming from, fretting about how your going to feed your children, or provide for their medication. THAT is poverty. And in the midst of this poverty in Poiana is a lovely fellowship of people who fall out with each other (as people do), who don`t always turn up for Church, make wrong decisions and yet a more welcoming group you couldn`t come across. Please pray for Annjella and her family, for Tante Lena and her eye operation and please pray for safety and protection over the WHOLE Chalmers family as they continue to work day-to-day, year to year in that place meeting the needs of people and remember before God the children of the village that they will continue to learn about Jesus and give their hearts and minds to him. 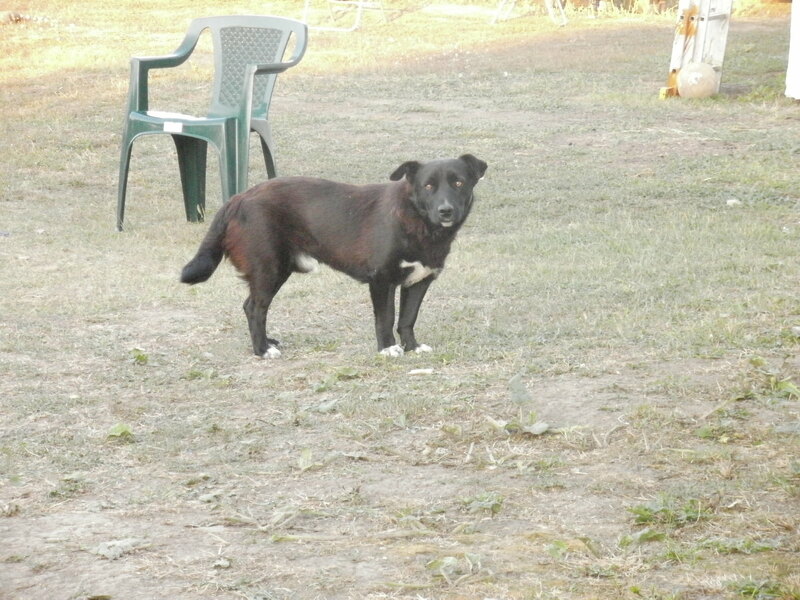 I close with a picture of the dog that came into the family last year of whom I was so proud that they had called him MIKEY after me. This year I can understand why…………………he`s got short stubby legs and a low wobbling stomach; hair which doesn`t know where its going or what colour its supposed to be. Maybe Mikey is the right name after all !